It's actually kind of funny, my relationship with kale. The only kale that I've really ever enjoyed eating or thought I could eat in salads was the prepackaged organic baby kale you find in the refrigerated section or your local grocery store. I knew that most people like to buy greens loosely, but I was too lazy to deal with it until I had the external motivation to begin reducing my waste. Once watching some of Lauren's videos from Trash is for Tossers, I decided it wasn't too difficult of a shift and I could be more willing to experiment with vegetables I'd never tried before! Seriously, though. I had such an unwillingness toward trying to eat any type of raw kale since the taste is so bitter and the texture so tough. I knew it was a superfood, and I enjoyed it sautéed and in soups, but eating it in salad-form just threw me back to when I used to eat Luby's as a kid in the 90s and it was decor for my jello cup. Chewy. Plastic. Tasting. Decoration. Vegetable. But honestly, I tried out massaged kale a few months ago and have fallen in love with making it in batches and keeping it in jars for salad and Buddha Bowl bases! 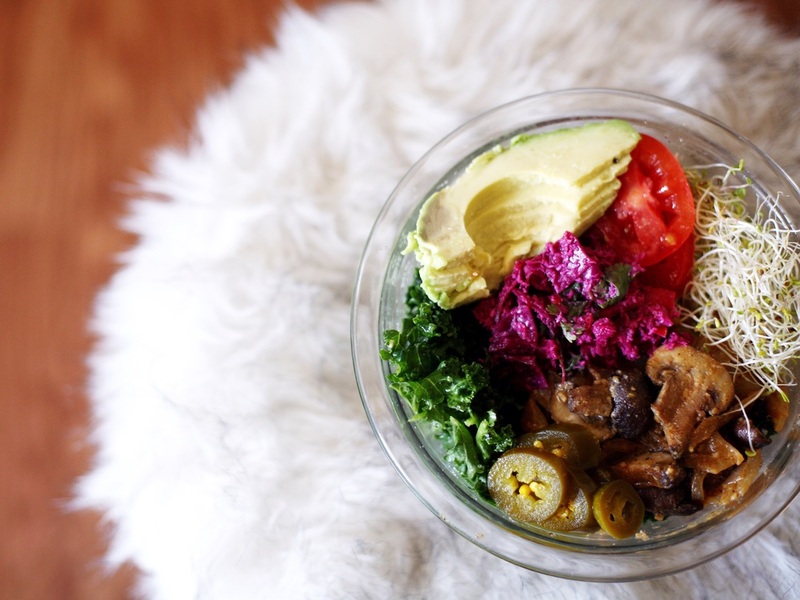 Check out my Buddha Bowl recipe where you all originally lost it over thinking of me sensually massaging a vegetable or something --- HA! I've also been so jazzed on our kitchen being a little more put together as of lately. 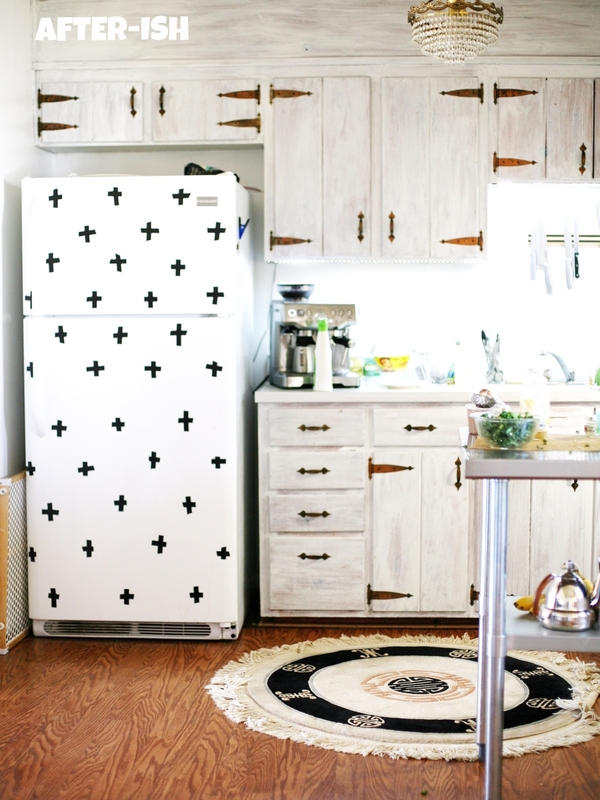 We updated our fridge with a little DIY trick from A Beautiful Mess, and I'm so obsessed with it. I really want to repaint our cabinets a solid white instead of an aged/shabby chic vibe. I thought that was where I was going but I changed my mind and found Rustoleum. Now, it's only a matter of convincing Collin and finding some sleek hardware instead of this barn-yard looking handles and hinges. I may or may not have spent an hour looking up gold handles for our cabinets and figuring out if it was worth the hassle or not since we are renting this home. I plan on being here for the entirety of our life in Nashville, so it seems worth it to me, especially if most of my work is done in the kitchen (which is also the laundry room but I won't get into that because I hate it). I also moved my desk/office space into the kitchen since I'm constantly working with recipes and such. 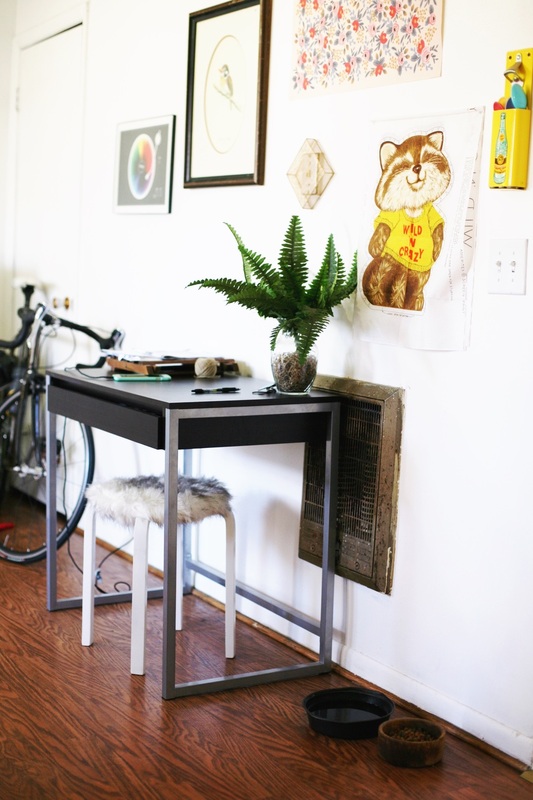 I'm wanting to paint the desk, or get a new one entirely. Bleh, I kind of hate it. I LOVE Laura Gummerman's take on it on ABM and am inspired! However, I'm torn since I desperately WANT a rug underneath (because I hate these laminate floors), but with our dogs and our muddy backyard right off of the kitchen, I just don't know! Renting is tough. I assure you **IT IS A THING I SWEAR** -- the reason it's recommended to "massage" your kale is so that you can gradually break down the tough cellulose structure of the plant, tenderizing out the toughness and sweetening out the bitter flavor that is usually associated with it! I've also found that this simple step not only contributed to an overall flavor makeover, but aids in digestion as well! If you find yourself struggling with the digestion of heavily fibrous leaves, try massaging them in an acid/oil mixture like this and see if it helps! Also, don't forget to CHEW! Your saliva is there for a reason --- to help break down food and aid in digestion. Don't skip it! *Tip* put your fork down in between bites to really bring awareness to your chewing. After rinsing your leaves in some quality organic veggie spray/wash, tear the leaves from the stems, trying to preserve as much leaf as possible. Pick those stems clean! You can save those stems for juicing or vegetable stalks. I also love throwing them in smoothies! Honestly, it's kinda fun to squeeze and tear and ring out the veggie! Just be careful if you're super sensitive to lemon juice on your skin, since that can sometimes cause irritation. For today's lunch, I decided to batch cook some organic button mushrooms and a white onion in olive oil and coconut milk with various spices and I was in heaven. In last week's post regarding easy tips to eat from home, I mentioned the importance of SAVING ALL GLASS JARS! I haven't yet invested in tupperware or anything resembling it since I took on this tip! 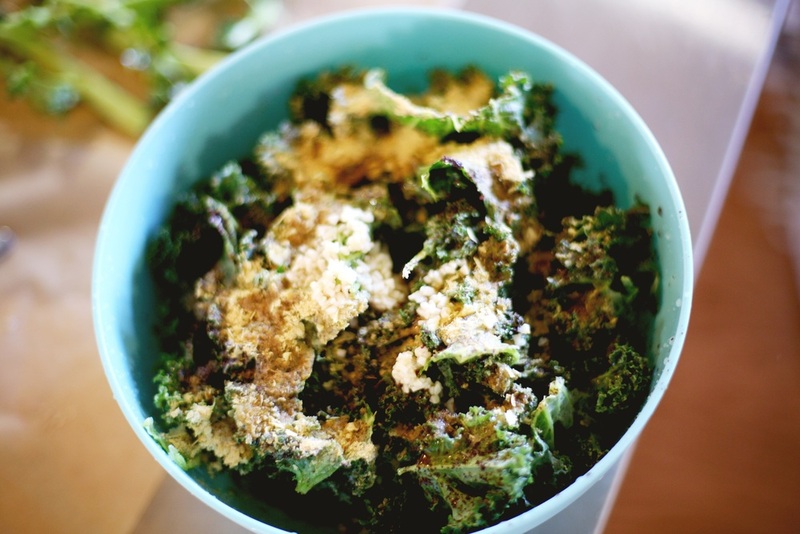 this kale has a caesar-y quality and includes nori flakes for the anchovy flavor. feel free to omit. 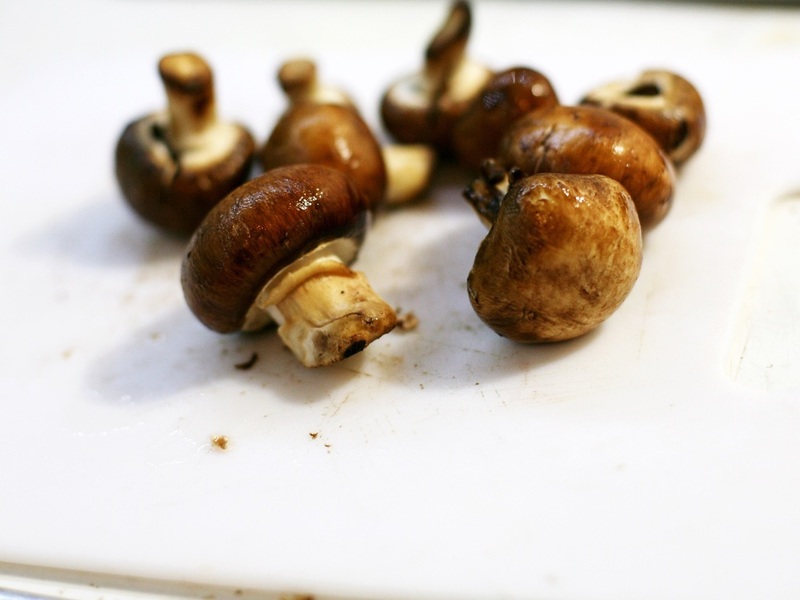 also, you can make the mushrooms while you're massaging your kale! Wash kale and remove leaves from stems. Save the stems for juice or something of your choice! 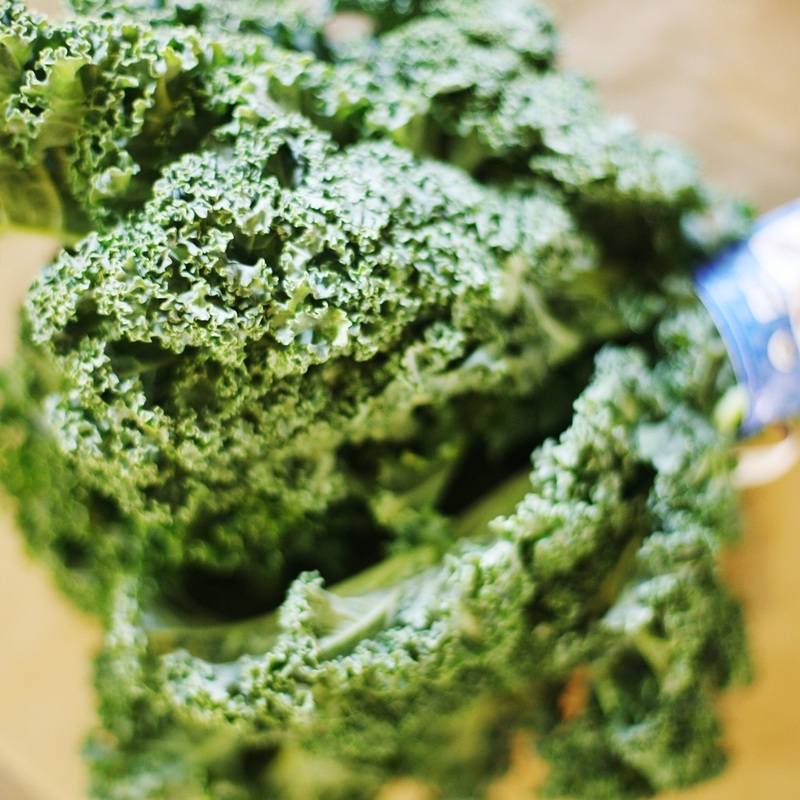 Put all kale leaves in a large mixing bowl and add ingredients to the top. Loosely toss with tongs. Using gloves or bare hands (covered in coconut oil if you can for protection from lemon juice) begin working all of the ingredients into the kale. Do this squeezing, wringing out, tearing, and tugging for about 5-10 minutes. Let kale marinade overnight or eat for lunch! 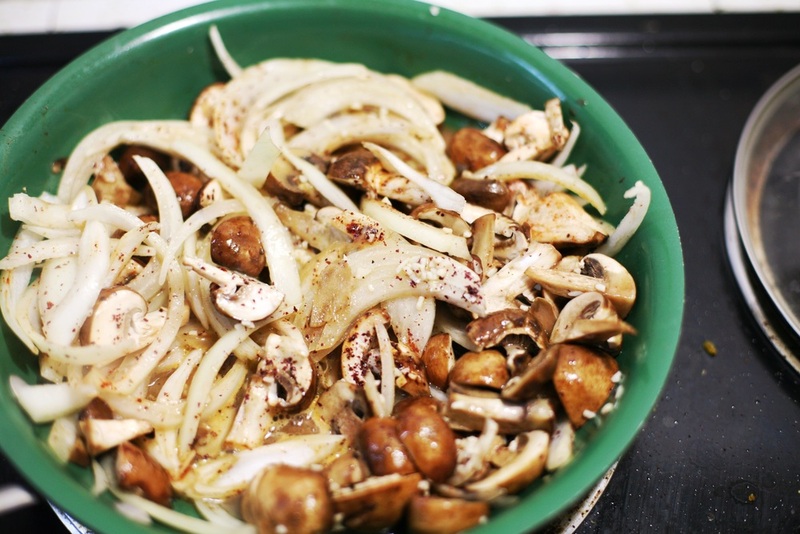 Slice your onion and mushrooms to desired size/shape and throw in pan with olive oil and coconut oil. Cover and cook on medium/high heat. After 5 minutes, add seasonings except nutritional yeast. Cover again. After 5 more minutes, turn off heat and add nutritional yeast. Serve! Love you all! Any recipe suggestions? Questions? Like this post and leave any questions in the comments!